There are mainly three seasons- winter season, summer season and rainy season. According to Science of Ayurveda, six seasons are considered – spring, summer, rain, autumn, Hemant, and Shishir. Maharishi Sushruta has divided the 12 months of the year into these seasons. There are two parts in the year. In the first part moves sun moves towards north facilitating Winter, Autumn, and Summer and in the second part sun moves towards south facilitating Rain and Hemant Seasons. During northward movement Sun is Strong and Moon is weak and during southward movement Sun is weak and the moon is strong. The winter season is the spring and spring season. There is no colder in this time nor does it get more heat. In the spring, blood circulation becomes intense and there is energy in the body. In the spring season, there is no heat burning in the heat and there is no rain or cold breeze, snow, and fog of Winter. For these reasons, the spring season has been called as the King of All Seasons. In this season, gradually start taking the dried simple diet. According to Charak Samhita, consumption of heavy, lubricant, sour and sweet substances and sleeping in the day is prohibited in this season. In this season it is beneficial to consume bitter, tincture, potassium-rich substances. When roaming in the morning breeze, chew new gums of 15-20 neems. This remedy protects against diseases such as skin disease, blood vessel and fever etc. throughout the year. In the summer, the wind blows in the form of bright light, which is very painful and harmful to health. Therefore, these days, follow the dietary advice and be healthy. Due to the high heat of the Sun, Air & Water component decrease in the earth. Therefore, for the maintenance of a Water Component, it should be consumed with sweet, liquid, light, digestible, fresh, aqueous, Cold and soft foods. Homemade Sattu, fresh lemon syrup, Juice, milk, Carrie, pomegranates, grapes, butter, fresh Chapati, peel with moong dal, sweet lemon, pumpkin, Gilki, gram greens, amaranth, parwal , Banana vegetable, green cucumber, coriander, mint, Gulkand etc. In this season, ‘ water-Therapy ‘ should be done in the morning. Drink four glass of water in the morning. It prevents blood pressure, diabetes, asthma, T.B. and even many the fatal illnesses. Do not drink water immediately after coming out of the warmer atmosphere. Drink early in the morning. If you have to wake up in the night, you should continue to drink cold water for an hour or so. It prevents bile and cough in the abdomen. In these days, our gastrointestinal becomes very slow. Vata defect remains chiefly in the rainy season. Therefore it is very important to focus on eating. In the days of summer, the digestive fire of man becomes dim. In the rainy season, it becomes even dimmer. As a result, indigestion, diarrhea, gastroenteritis etc. are more prevalent. Do not take a latex diet in these days. Due to indigestion, it is advisable to consume edible and plain foods. Do not consume stale, rusty and warm nature foods. In this season, consumption of rice for old barley, wheat, is particularly beneficial. When making a meal in the rainy season, mixing a little honey (honey) in the diet releases indigestion and feels hungry. Regular consumption of honey in small amounts is also good to overcome indigestion, fatigue, and ventilation. In the rainy season, abdominal diseases are more common, so ginger and lemon should be used daily in food. Lemon is very beneficial in diseases occurring in the rainy season. In this season, mangoes and berries are considered best in fruits. Makes the common intestines powerful. Autumn can be considered from 16th September to 14th November in terms of overall India. Autumn comes after the rainy season. The outbreak of naturally accumulated bile duct in the rainy season increases in autumn. This turns away from the digestive nature of the bile in this season, it becomes ingenious. The result is fever, dysentery, vomiting, diarrhea, malaria etc. In Ayurveda autumn is called the ‘ mother of diseases “. In this season there is a natural increase in the incidence of gallbladder and salts. The sun’s heat also looks particularly sharp. Therefore, the use of such sweet (sweet) , tikta (bitter) should be used exclusively to suppress gall bladder, salt juices and heat. To lessen the outbreaks of the gallbladder, take special, sweet, cold, heavy, bitter and tasty items. Vegetables are very good in this season, but due to the new water of rainy season, they are faulty. They have excessive salts (salt) juice. Ghee-milk is an antidote of the gallbladder. In this season, wheat, barley, jowar , paddy, common grains etc. should be taken. Watermelon, pomegranate, grapes, coconut, ripe papaya, moosambi , lemon, sugarcane etc. can be taken. By eating kheer, rabri etc. in the autumn, is beneficial for health. Eating by adding ghee and cardamom in ripe banana also beneficial. Sugarcane juice and coconut water are very beneficial. With the presence of both the winter and transitional periods, their properties can be availed because the Hemant Season gives us the nutritious power of the transitional period. In addition, the transition begins in the winter season, but the rays of the sun are not so intense that they can absorb and dry out the juice. However, due to the beginning of the invocation, the light and early rays of the Sun seem to be pleasant. In winter, man gets a naturally superior force. Due to the gastric cold, Pancreases Gland is powerful and intense. it burns body metals. Therefore, in the winter season, eat salty, sweet sweet foods. In this season, nutritious, potent and curative recipes should be consumed to strengthen the body. Sattvic foods are soothing, nourishing and promote and maintain a quiet, steady mind as well as help to sharpen your intellect and give you a greater sense of empathy. Sattvic foods are vegetarian and do not include foods derived from animals that have been harmed in any way. It is important that foods are grown naturally and do not contain preservatives, artificial flavors, or additives. In addition to fresh, organic, whole foods, a sattvic diet requires the energy and intention within your kitchen to be a calm and pleasant atmosphere for food preparation. Preparing your food with mindfulness, care and love will create energetic vibrations that are absorbed by the food you are preparing and will enter your body during digestion. The quality of your food is greatly enhanced by loving attention, including how the vegetables are cut, how the spices are ground and the way you add ingredients to the dish you are preparing. It is important to remember that a sattvic food is intended to improve the mind. 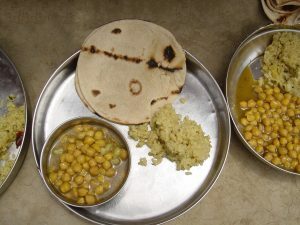 A Rajasic diet, consisting of food that is spicy, salty and sour in taste and a tamasic diet, which includes food that is stale, overheated, oily, heavy and often canned or preserved in some way. Aspects from each of these diets may be recommended to help correct a doshic imbalance or physical illness. However, as a general rule, Ayurveda recommends a sattvic Foods for people who are, by and large, healthy and balanced.